Hi guys! 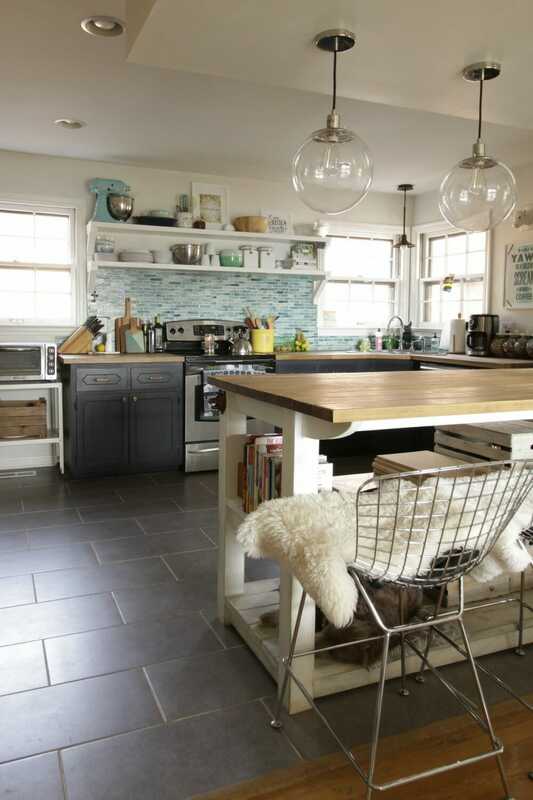 Thank you so much for all of the love on the kitchen island’s new cleaner look yesterday. Simple changes can really have big impact, can’t they? As I mentioned in that post, this year I am really making our house work for us, and while design and style will always be important to me, I am leaning towards a less is more approach (wellllll, as much as I am capable of there!) and making our spaces more utilitarian. 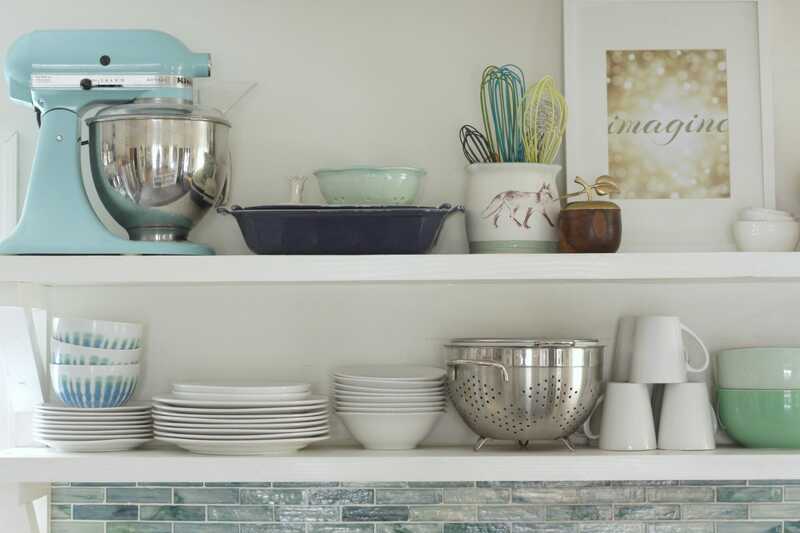 I’ve always enjoyed styling our kitchen shelves, and I am sure that will continue, but the approach has become more functional. Because we have open shelves, and really not much lower cabinetry, one of the questions I get a lot is, “Where do you store everything?” As you saw yesterday, we store many items (salad spinner, small electronics, miscellaneous kitchen junk) in crates on our island for a cleaner look. Standing alone, the island is not sufficient storage, so we’ve carved out more spaces and created other areas that have jobs for our family. 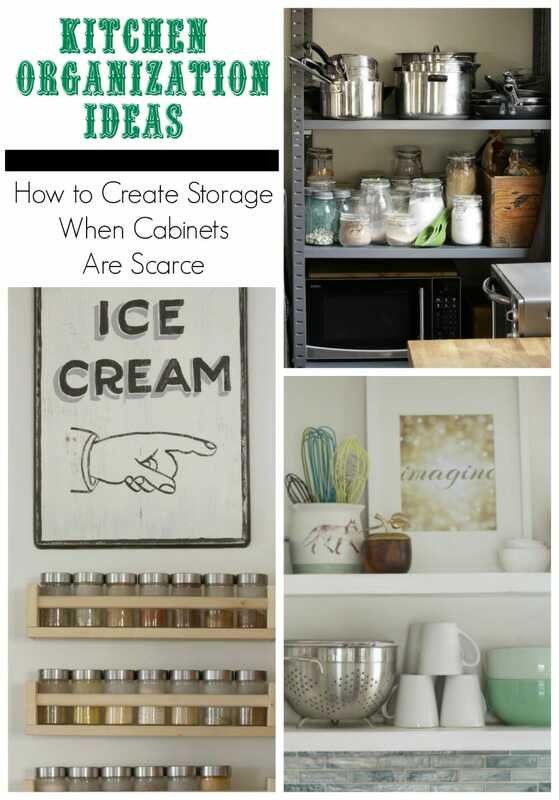 Today I want to share with you how we create kitchen organization with open shelving. I also want to repeat something I mentioned yesterday… these photos aren’t styled; everything you see is as we use it day to day. Let’s start with the open shelving. In the past I have had a blast styling these for holidays and seasons. But once I put away all of the Christmas decor at the end of December, I was over it. I wanted them to be filled with more useful every day items, so I stripped them down, then added on much of what we use daily. From there, I took much of the clutter from the island including colanders and bowls, baking dishes and salad bowls and started filling in spaces with those items. It does help that over the years I’ve collected some useful items that are beautiful as well, and some have been gifted. The Kitchenaid mixer in aqua was a Mother’s Day gift a couple of years ago, and I use it quite often. Another question you all want to know is “who gets the mixer down?” Well, I do. Yes it’s heavy, and I have to reach for it, but I am perfectly capable of it. If Emmy needs it to bake, I get it down for her. It’s really not that bad! The whisk collection of course is not the most useful… who needs that many whisks? Year after year my parents put a whisk in my stocking, and one year, I finally told them I had amassed a sufficient stash of whisks. Now each Christmas, they try to find a funny or unique one, so it’s just become a little family joke. The crock they sit in was also a gift from my parents for my birthday a few years back. Artwork of course isn’t always useful, but I love to add a little height to my shelves with it and create a mood. It also doesn’t take up much space on the shelves. Everything else you see below, we use. The apple holds our kitchen chalk, and those are measuring cups to the right of the art. On the other side, our salad bowl and prep bowls sit on the top shelf, surrounding a piece of art I found at Nest Fest. On the lower shelf sit some of our favorite cookbooks and recipe box, as well as our sugar and flour canisters and salt cellar. We actually use a lot of our counter space as you can see below. We’ve got our utensil crock, basket for our fresh eggs, and some vintage canisters filled with snacks and such. To the left of where the cabinets end, the adjacent wall houses our refrigerator. When we redid the kitchen a few years ago, we knew the fridge would sit here, but I knew I wanted to use the rest of the wall for storage as well as frame it out so it didn’t look awkward. We purchased an industrial shelving unit that fit perfectly next to the refrigerator for the corner and was super affordable. For the other side I found a vintage mint filing cabinet. The mint piece holds our every day glassware in its open shelf, and each drawer has a designated purpose… there’s the bread drawer, the ever-necessary kitchen junk drawer, and a mug drawer. 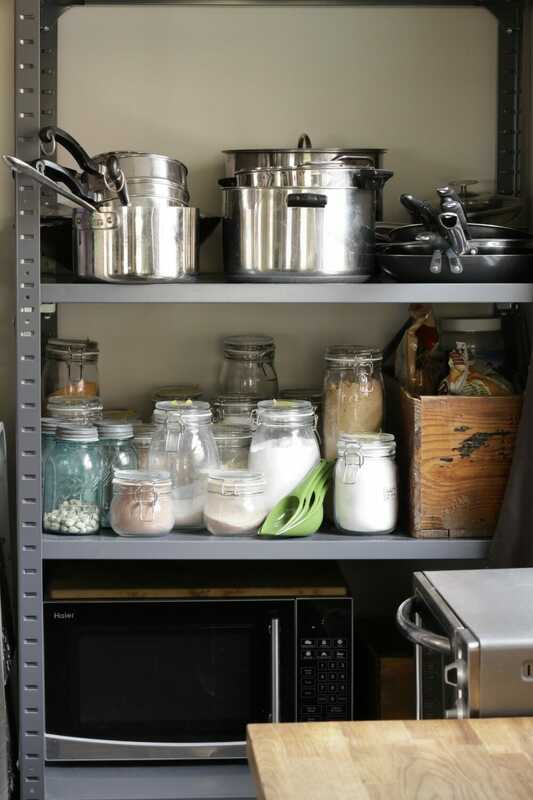 On the steel shelving, we store our pots and pans, large electronics, and dry pantry goods since our pantry is a joke… a small closet with duct work going through it. As you can see, there’s a little step stool to the right which I use to reach things on the back of the top shelf if needed, and the kids use it to reach anything they might need as well. This past fall, I stocked up on glass canisters of all sizes at Ikea to at least make my dry goods look a little more uniform here. Prior to this, everything was a jumble in crates. I found the little set of scoops at a vintage market this past fall and they work perfectly in these jars. 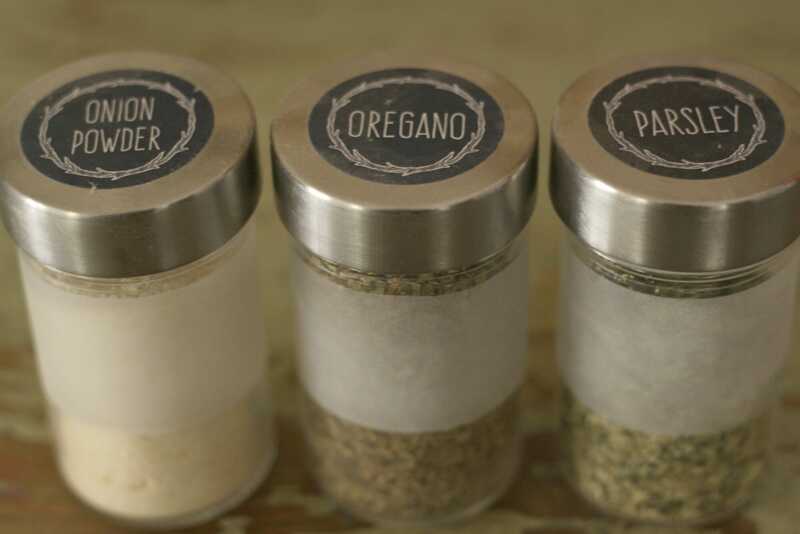 I’d love to make pretty labels at some point for the jars…. right now they are labeled with yellow painter’s tape on their lids. Keeping it real here, my friends! 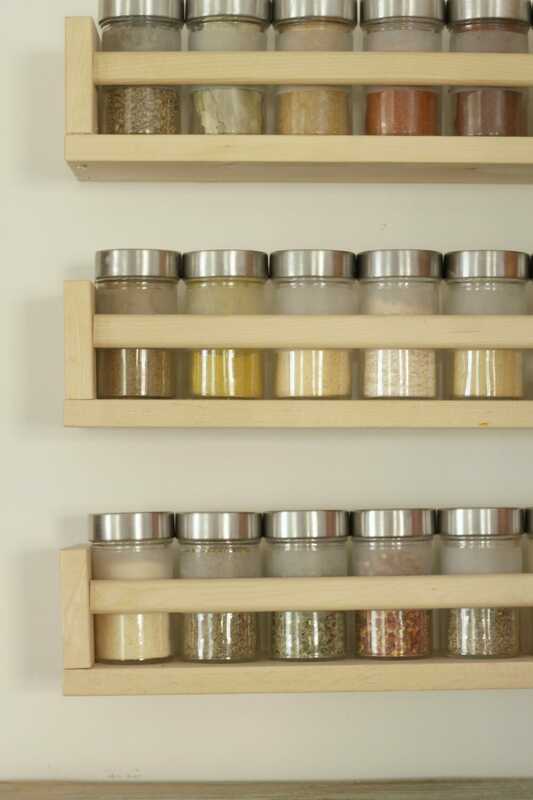 With limited pantry space and cabinetry, our spices were a hot mess and we often accidentally bought a seasoning we already owned because we just couldn’t find it. 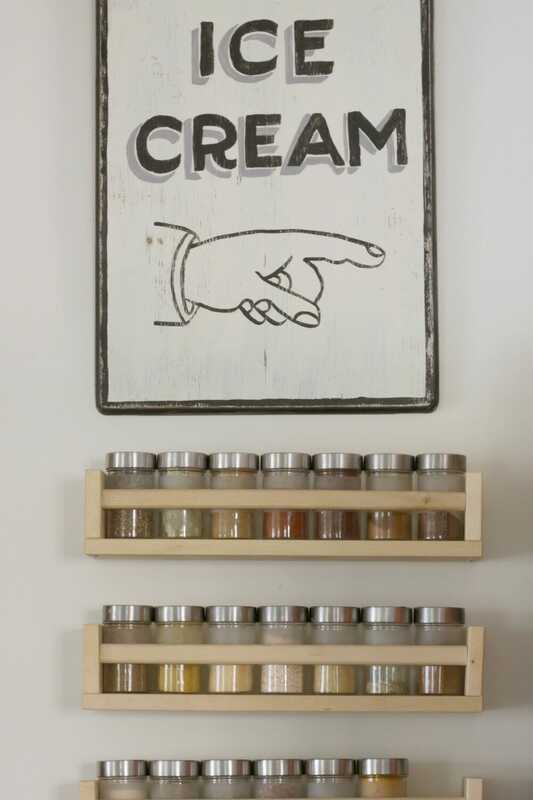 While I was purchasing those glass canisters at Ikea this fall, I also took home a few of their simple and inexpensive wooden wall mount spice racks and jars to fill them up. Since this room has open shelving and opens to the dining room, wall space is also pretty limited, but I carved out a little wall space above our filing cabinet. (The ice cream sign was a purchase from a local vintage barn sale, Chartreuse & Co. It’s not vintage but was painted on an old table leaf). Their racks are definitely not perfect and they are a little off kilter (that’s Ikea, not me! ), but they work for us. Although the yellow painter’s tape makes adorable labels, I found these perfectly sized labels on etsy and ordered a set for my jars. 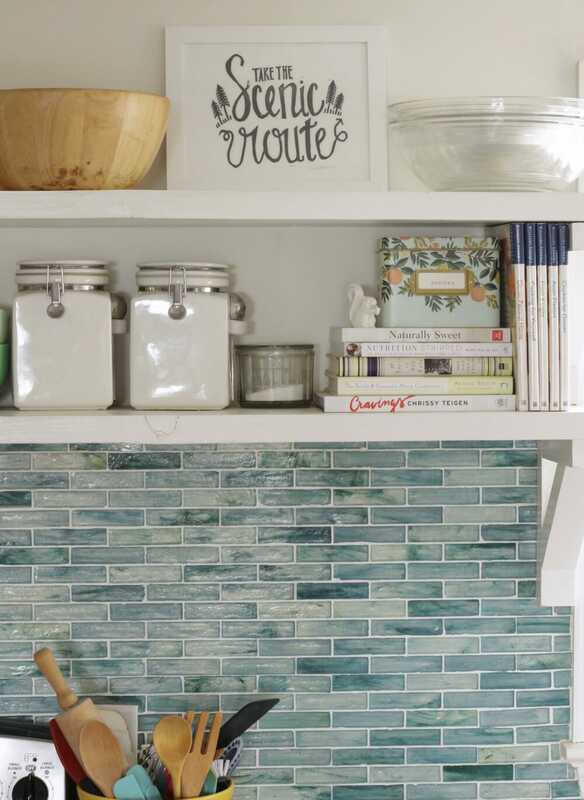 One last space I want to mention in the kitchen that works well for us is our doors. I painted the pantry and kitchen closet door with chalkboard paint. The pantry door houses our ongoing grocery list, and the closet door features our weekly appointments and plans. I used to have it set up so that it covered the entire door, but to be honest, writing anything on the lower portion felt awkward, so I changed that. Luckily it’s easy to do since it’s just chalk. As you can see peering into the dining room above, I’ve made some changes there as well. I just was not feeling the motivation in January to photograph and write about spaces… It just didn’t feel important. 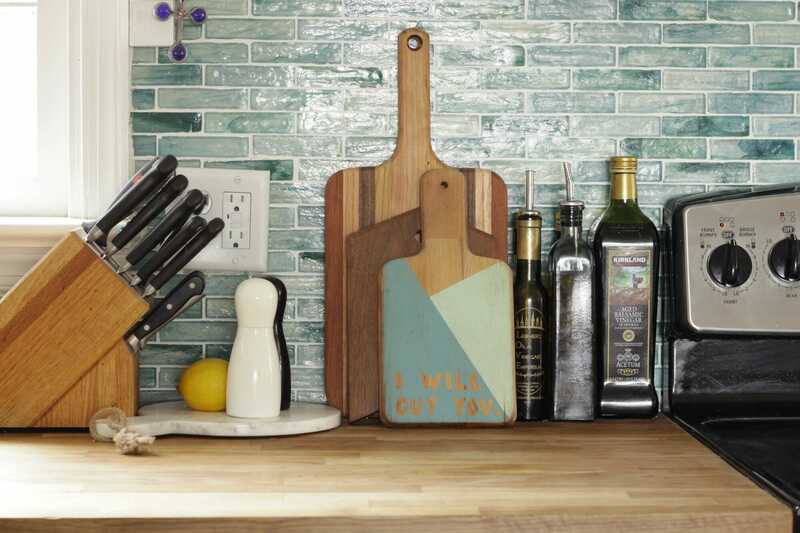 But now that it’s truly working for us as a real family, I felt like it was worth sharing the ideas that help us keep our kitchen fully functional. Hopefully you’re not too sick of this space this week, because I’ve got one more update to share with you later this week. 😉 Perhaps you’ve noticed…. it’s actually two things. Have fun playing I spy! I love, love that white piece in your dining room. Where did you find that? It’s awesome. I would have a hard time with open shelving. Keeping things organized behind glass cabinet doors is hard enough!! thank you! i bought it from a friend who was moving (you know karen aka the graphics fairy?). it’s an aztual antique piece and i love it!! it’s perfect for mail, etc. i love how you have your kitchen set up!!! it suits you and your family. having all that out would drive me nuts but everyone has their own style! 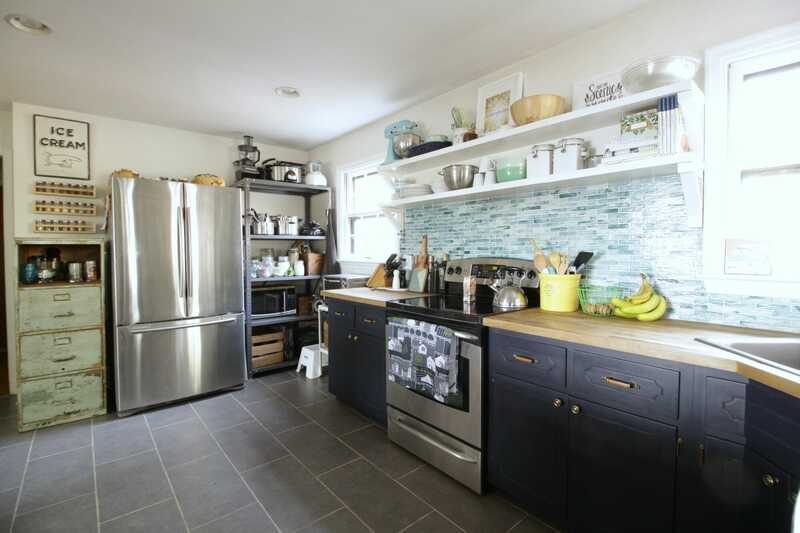 i used to think i was all about the farmhouse with open shelving, but I like having limited things, and being able to close them behind the kitchen cabinets. However, i definitely still want a light & bright kitchen. thank you so much, erin! yes, sometimes it does drive me batty and with the dogs we do get a lot of dust, but it works well enough for us! 🙂 and i have to say the more openness feels better to me- upper cabinets can make me feel closed in. Clean and simple; I love it! Good. It’s a great contrast with all the white, yet fits in so well. 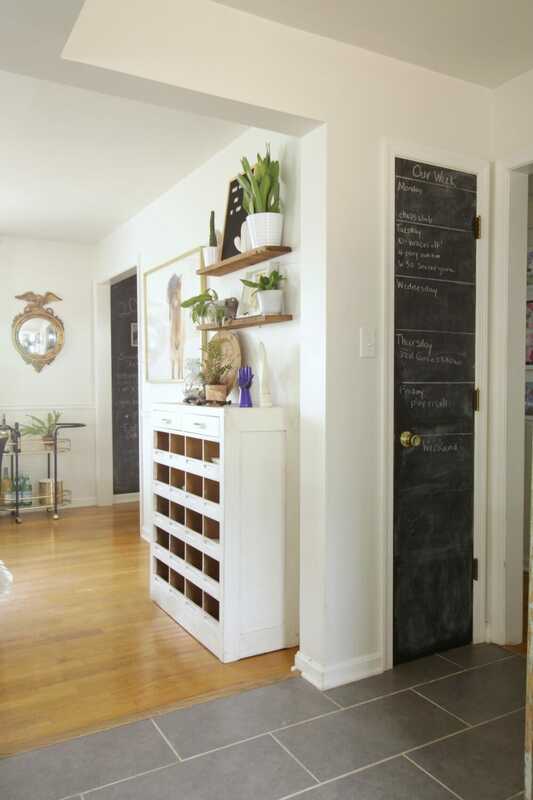 I miss my chalkboard wall in my kitchen. I’ve thought of making another one but just haven’t gotten around to it. Love your storage girl and your whole kitchen. i have two antique doors in the perfect size i actually want to replace the kitchen pantry and closet door with… one day. i have to figure out how to do that and i think it would require reframing which scares me. I love your open shelving and hope to have some myself one day.. I tried your Etsy link for the spice labels ( love them!) but the message I got was there was a problem with the URL. Thanks Cassie – your house is great. oh thank you! i just fixed it and tested it and it is working now. thanks for the heads up and for the lovely comment! useful things that are also beautiful are pretty much my favorite :). I always love seeing your kitchen! i have to agree!! best of both worlds when you can use something beautiful! I love how your spaces are eclectic but also feel pulled together. 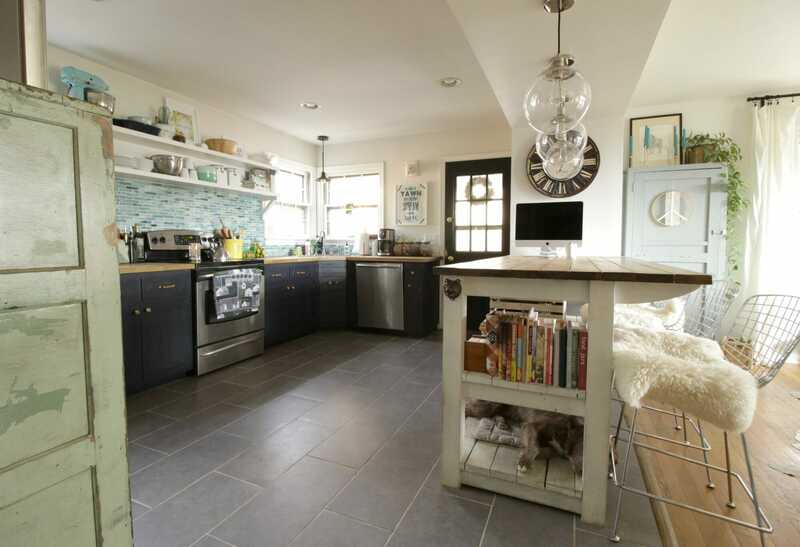 That island is still one of my favorite things about your kitchen reno. Such a family friendly, warm, happy home!! thank you, lisa! i love that island, too! i was thinking of changing the counter on it to marble but man that would cost so much. I’ve always felt like your kitchen is one of the most beautiful I’ve seen and it’s definitely because it actually looks like a kitchen. It’s so warm and obviously used and it’s charming in that special way. I just absolutely love how you create such beautiful functional spaces. You are the master!!! no, my friend. YOU are. thank you so much, carol! yeah, i finally decided i needed to not worry about the style and look as much and i needed to worry about making this house work for us in all aspects and i needed less non-purposeful stuff around. 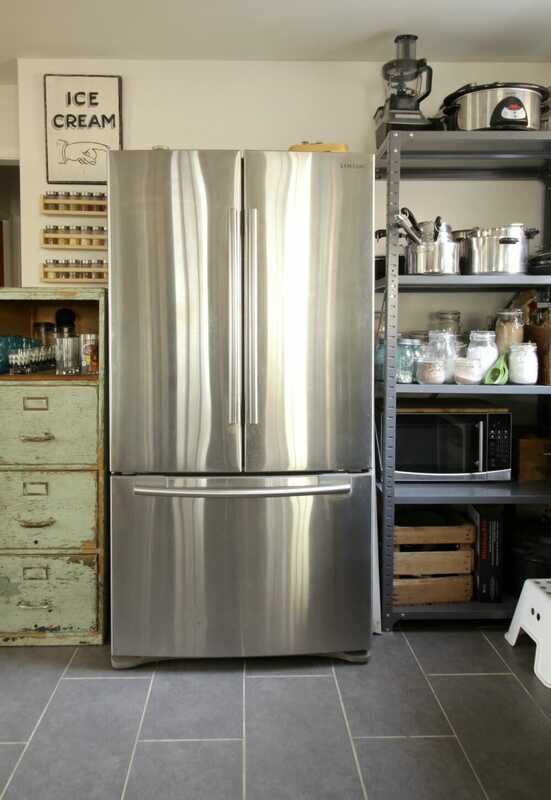 How do you keep your stainless steel fridge so shiny? I swear I wipe mine down every day, but it never looks shiny, and I’ve tried so many cleaning methods and products with no success. Spill your secret. 🙂 Beautiful kitchen – I’ve always loved your floors and backsplash. It is lovely! ok so i clean mine with method all purpose cleaner for regular quick wipes, but if it’s gotten bad, i use barkeeper’s friend and get all the ick off. then i use olive oil to wipe it so that it shines and protects. then after that i can use the all purpose cleaner for a bit until i notice it’s bad again.